Wood decay fungi have evolved different life-history strategies to fit them for the many and varied niches available in different types of woody resource and at different times in the decay process. Based on ideas from plant ecology (Grime, 1977, 1979) fungi have been described to be influenced by three major environmental determinants: (i) incidence of competitors; (ii) stress—an abiotic factor that limits the production of biomass by the majority of organisms, e.g. extremes of pH, temperature and water content; and (iii) disturbance—a sudden event that provides new resources with or without partial or complete destruction of the resident organisms, termed, respectively, destructive and enrichment disturbances (Pugh, 1980; Cooke and Rayner, 1984; Rayner and Boddy, 1988; Andrews, 1991). 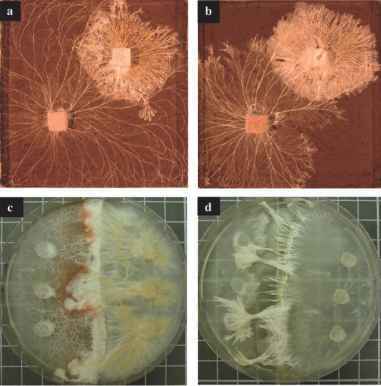 This subsequently led to the formulation of three primary fungal life-history strategies: (i) competitive (C-selected); (ii) stress-tolerant (S-selected); and (iii) ruderal (R-selected). Many fungi, however, are subjected to combinations of these environmental determinants and hence secondary (combination of two) or tertiary (combination of three) strategies have evolved. Applying ecological strategies developed for plants to fungi is not without difficulties since they have very different lifestyles (Ohtonen et al., 1997). Plants compete for light and nutrients in two different spaces (above and below ground), while wood decay fungi compete for nutrients in a single space (inside a piece of wood), though cord-forming basidiomycetes may transport nutrients between units. In solid bulky substrata such as wood competition is for space; occupancy of territory allows the fungus to access the nutrients held therein as and when necessary. The term combat is, therefore, in most situations more appropriate for wood decay fungi than the term competition (Cooke and Rayner, 1984; Rayner and Boddy, 1988), though competition for nutrients in the classical sense does occur when mycelia grow out through soil. Competition/combat between wood decay fungi often occurs between mycelia meeting along a clearly defined border (Boddy, 2000), while competition in plant communities is spatially diffuse. Also, wood is a temporary resource that is continually diminishing and physically and chemically changing. Thus, conditions during initial mycelial establishment may be very different from those experienced by the established mycelium. Further, wood decay fungi need to move to new resources before the old ones disappear. Bearing in mind these reservations the classification of wood decay fungi in terms of R-, S- and C-selection is still very useful. These strategies can be used to define the behaviour of an organism in a particular context, but not to classify organisms per se, since different behavioural characteristics may be adopted at different stages in the life-cycle, when the mycelium is in different physiological/ biochemical modes, and under different environmental regimes. For example, the coenocytic margin of Phlebia radiata mycelium extends rapidly, utilizes simple organic compounds and does not respond aggressively to other fungi (R-selected characteristics—see below), while the more mature, septate mycelium is able to use lignocellulose and is antagonistic to other mycelia (C-selected) (Boddy and Rayner, 1983). and rapid growth. Fungi with C-selected characteristics are favoured in relatively non-stressed, undisturbed conditions; the domains of fungi colonizing organic resources increasingly overlap and competition/combat ensues. Other C-selected characteristics include long-life expectancy and wide enzymic ability. S-selected characters include: ability to cope with a particular abiotic stress or set of stresses; slow or intermittent commitment to reproduction; and often slow growth.